Relax in the comfort and beauty of the Amish Rochelle Dining Chairs, offering a generous seat and ample back support. 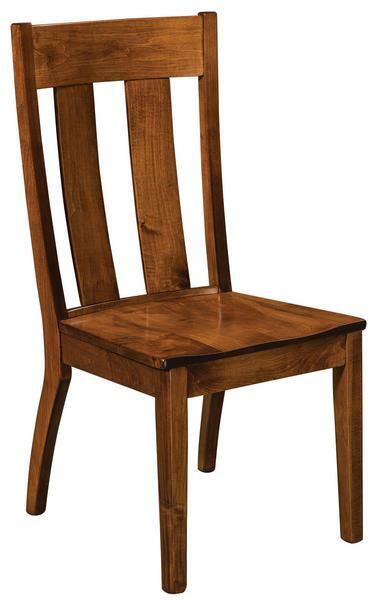 Surround your dining table with custom made dining chairs in the premium solid wood and stain you love. Mission style furniture takes a basic style and brings out the beauty in it through exceptional craftsmanship and quality materials. These mission dining chairs are made to host your everyday meals and all of your celebrations throughout the chapters of your life. These are dining chairs that will be passed on to future generations to enjoy. The Rochelle is shown here in brown maple wood with Michael's cherry stain. Brown maple wood has a sleek and smooth grain, making it a stand out at displaying dark stains or paints. The Rochelle is available as a swivel bar stool or a stationary bar stool, for matching seating throughout your dining room and kitchen.